We hope that by fully committing ourselves to this project it will enable our visitors to have a pleasant and relaxing stay. The Bas Mesnil is nestled in a tranquil corner of the countryside and our aim is that each of our visitors will find the level of comfort and favourable atmosphere that will lead to a relaxing stay. 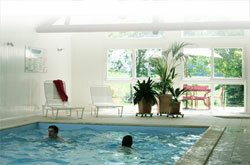 The indoor heated swimming pool that is integrated within the gite should help to contribute to this. Whilst browsing through these pages, let us know your thoughts and don’t hesitate to contact us for further information or any questions. Enjoy your visit and we hope to see you soon !